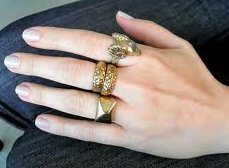 Wearing a ring on a specific finger means that you need an extra boost in the indicated area. This information is based on Johnny Fincham’s book entitled The Spellbinding Power of Palmistry, which is one of the palm reading books I highly recommend. An accident is almost always a way for your subconscious mind to give a sign to your conscious mind. Hurting your finger is no exception. According to Louise Hay’s You Can Heal Your Life, fingers represent the details of life. 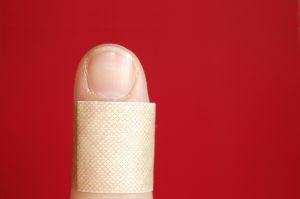 If you cut, bruise, burn or otherwise hurt one of your fingers, check which one is concerned. It will help you identify in which area of your life you need to relax and let go. Middle finger: Sexuality or anger, or both. When you are angry, Louise Hay suggest you hold your middle finger and watch the anger dissolve. Hold your right finger if you are angry at a man, and your left finger if you are angry at a woman. Officially called "leukonychia", those little white spots can often be seen on the pink part of the nails, in the absence of nail polish or plastic nails. There are many explanations as to the reason for those spots, including mild trauma, skin condition or mineral deficiency, such as zinc or calcium. However, white spots usually reveal a certain amount of anxiety in one specific aspect of your life. If you see several spots on a specific fingernail, make sure they are present on the same nail of both hands before you draw any conclusions. Since it takes approximately six months for a fingernail to grow to its full length (only the pink section), you can easily identify the time of the problem, based on the location of the spots. By regularly checking my nails - and my friends’ nails - and comparing them to personal events, I have accurately pinpointed specific problems in my life, as well as the time when they happened. Remember that it is not the problem itself that creates the spots, but your reaction to this problem. Thumb: Relationships or anything related to “basic instincts.” During my divorce, my thumb looked like snow falling in Winter! Index finger: Work or ambition. 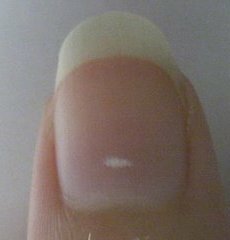 Conflicts with an employer or tensions regarding a promotion are often reflected on this fingernail. Middle finger: Your sense of right and wrong. A friend of mine who was terrified of not being a good mother always had spots there. Ring finger: The ability to enjoy yourself. When you feel guilty for having fun, spots appear on the ring fingernail. Little finger: Communications. I have seen spots on this finger when a person can’t communicate or communicates too much to be effective. For more information on fingernails, click here. This self diagnosis finger reading technique gives you the information. Whatever you do with it is up to you. Just be honest with yourself – sometimes we don’t want to see the truth – and see what can be done so you can have more balance in your life.